For fans of sports betting, there’s a new online slot game for you. Bookie of Odds is a new game from Microgaming that features horse racing as it’s central theme. The bookie themed slot game is a 5-reel game that offers players up to £25 per spin. A couple extra features lets players customize their bets far more than most other slots games would allow. There aren’t too many sportsbook-themed slot games. There’s the classic Frankie Dettori’s Magic Seven, which comes about as close as you get to a sportsbook slot game. There’s plenty of sports-themed slot games, but only Microgaming thought to appeal to both slots lovers and sports bettors. The two types of gambling are not mutually exclusive, so it’s a bit surprising it took as long as it did for a company to put forward the idea that blends sports betting and slots together. Together with Triple Edge Studios, Microgaming brings forward a game that offers odds that even the most hardened sports bettor would enjoy. With a Return to Player of 96.31%, it’s nearly impossible not to walk away with winning numbers. Bookie of Odds seems like your standard slot game initially. Players are offered 5 reels, with 10 paylines available for players to win with. Spins go from £.10 to £25 depending on how much the player feels like risking. Where Bookie of Odds changes the game is the Reelbet Respin feature. Like changing the legs of a parlay bet, players can respin one specific reel as many times as they like. In fact, you can respin any specific reel as many times as you like until you can find the ideal result. It’ll cost you, but the potential prizes are huge. Each reel tells players how much a respin is at the bottom of the reel. The better the surrounding reels line up, the more a respin will cost. Yes, you can win all the regular prizes off a single-reel respin. So what can players win? Three or more scatter tiles, that come in the form of a golden sportsbook, will give players more free spins. Three for 10, four for 12, and five for 25. When handing out free spins, Bookie of Odds selects one tile at random that will create added bonuses if three or more appear on various reels. If three or more of your randomly selected tiles appear across the reels, that selected tile will take over the entire reel, essentially providing a free win. And if players hit three more golden sportsbooks, then more free spins for you. This can go on infinitely if you’re lucky. 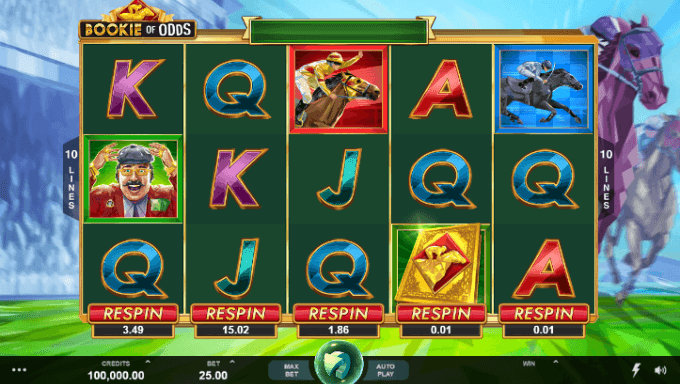 There are no single-reel respins, however, during free spins. As mentioned before, the Return the Player is a solid 96.31%. The percentage is actually higher when using the single reel respin. When running a respin, your RTP increases to 96.5%. While on paper it’s not a massive increase, it’ll certainly feel like you’re winning more often.